Your privacy is important to us, and we operate in compliance with GDPR. We strive to ensure that we operate to the highest standards with your data. This policy sets out how we collect information on your data through this site and in your contact with us. We shall use your data lawfully, fairly and transparently. We shall collect your information for specified, explicit and legitimate purposes and compatible scientific and statistical research purposes. Your data collected will be minimised to what is necessary. Your data held shall be accurate and otherwise deleted. We maintain your data to high-security standards. We collect your data through this website and in other interactions we have with you. We maintain your data confidentially and securely at all times. 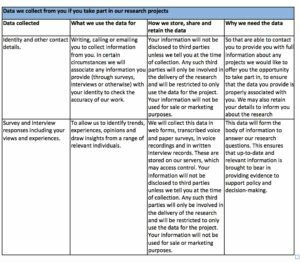 We will only disclose your data if you have explicitly consented for us to do so or if you are taking part in our research and have been explicitly informed before providing your data that this will happen. 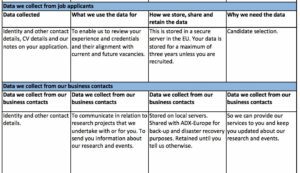 We only share your data with organisations and employees who are involved in delivering the service we offer you or the research you participate in. Our employees and any organisations we pass your data to are subject to a legal obligation to comply with data protection law that assures the confidentiality and protection of your data. We obtain your consent before contacting you by email to provide research updates or details of events. Where we organise events that involve third parties we will obtain your further consent before passing your details to them and then only the minimum details necessary to facilitate the event. Where we have provided you with our services, we will keep in contact by email to provide information about our services but will always provide you with details of how you can change your preferences about being contacted by us by email about any marketing information by contacting us at info@panaxea.eu. Panaxea where it is necessary for the purpose of delivering the agreed services. Organisations involved in our research projects only for use in those research projects. The reasons for use in the research will be made known to you before you participate in the research or otherwise, your data will only be used for research and statistical purposes consistent with the reasons you originally provided the information. Such an organisation will always be obliged to ensure the security of your information and to be in compliance with privacy laws. To withdraw your consent for us to process your data. If you wish to exercise any of these rights, please contact Panaxea by email at info@panaxea.eu. Where you request information from us, we will need to confirm your identity to ensure the security of your data. We will endeavour to respond within 30 days but our response time may vary depending on the complexity of your request. A fee will not normally be charged unless a request is considered to be without basis, repetitive or excessive. Where we request a fee, it shall always be reasonable. We occasionally include links to other sites. We will take every reasonable step to ensure that links provide a pleasing online experience, but we are not responsible for the privacy practices or the content of such websites. Panaxea and its partners may place cookies on your computer to enable Panaxea to understand, among other things, which web pages are visited, the order in which they are visited, and which hyperlinks, if any, is clicked. Panaxea partners with analytics firms—including Google Analytics, and Hubspot, among others—which record visitors’ IP addresses, operating systems (e.g., Windows or macOS), browser software (e.g., Safari, Firefox, Internet Explorer), and internet service providers. Although these data are not personally identifiable information on their own, they can be used to determine the approximate geographic location of a visitor’s point of connectivity to the internet. Panaxea reserves the right to amend this policy at any time. Older versions of this policy are maintained and can be accessed on request by emailing us at info@panaxea.eu. 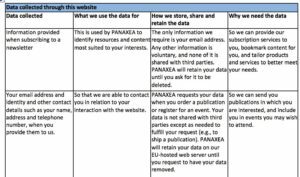 If you wish to lodge a complaint about the processing of your data you may contact Panaxea at info@panaxea.eu.